This is the first book to set out a full range of research strategies for evaluating the clinical practice of acupuncture. Leading acupuncturists and researchers with international reputations share their expertise. They illustrate their descriptions with practical examples of what has worked and what has not. It outlines many of the key challenges in the field. These challenges relate to the nature of acupuncture and the gap between current research evidence and the actual experiences of acupuncturists in the field. By focusing the chapters on key research questions, rather than methods, the book has a user-friendly feel. Each chapter is easily accessible with brief explanations of research designs as well as vignettes of relevant past research. The book is based on a deep understanding of acupuncture, with its inherent complexity in practice, whether based on traditional principles or more modern concepts. 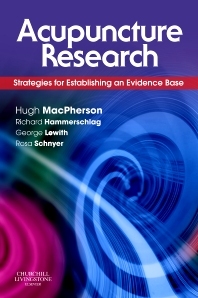 By incorporating a more sophisticated understanding of the field, this book details a range of strategies aiming to develop the evidence base with the utmost rigour. It is the first book on acupuncture research to take this unique view, integrating the very best of evidence-based medicine with a genuine sensitivity to the discipline of acupuncture, from its traditional and holistic roots to its more modern interpretations.